Date of Entrance Examination : May 29, 2018. Bihar Combined Entrance Competitive Examination Board (BCECEB) has released the Bihar ITI Admit Card 2018. 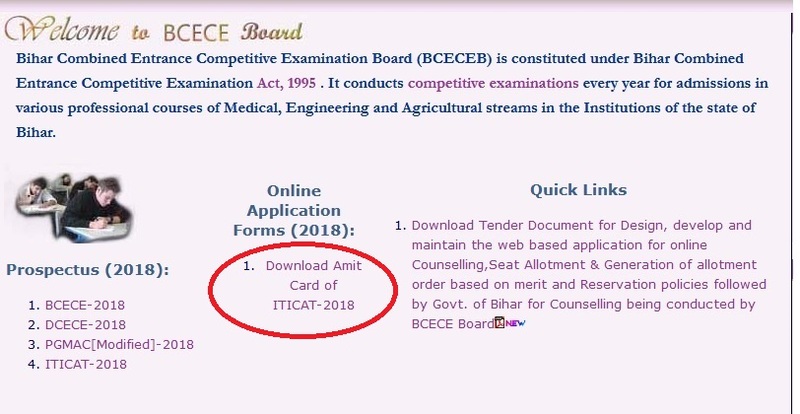 Bihar ITI Admit Card 2018 has been released at the official website of BCECEB.The written entrance exam is scheduled to be held on May 29, 2018. Step 1 : Go to the official website,view the home page Click on “download the admit card” link in Application form menu. Step 2 : Next screen will be opened, click on the “Click Here” link. Step 3 : Admit Card page will be displayed, Enter the following details. If your forgot your register number, please do follow the below steps. Step 5 : Click on “search” , get your register number. ** ITICAT 2018 will consist of a single question paper having multiple choice questions. ** The question paper will contain total 150 questions of 300 marks. ** Each question will carry 2 marks. ** The duration of exam will be 2.15 hours.